When was the last time you bought something without checking for an offer coupon or some special discount online? Even if you are among those who don’t go coupon hunting, you will agree that one of the most attractive things about shopping online are the numerous offers available. You would expect walk-in stores to pick up the hint and start ramping up their offers too. Guess what? They do. If only there was a service which you could use to conveniently find the offers from the stores around you. Guess what again? There is one and it’s called NearU. Capitalizing on the discount hunting behavior of the modern customer, NearU lists offers and special prices from stores all around from multiple categories like Food and Beverage (we were sure to put this first! ), automobile, clothing, electronics, health and beauty to name a few. It also lists hot deals across categories that are worth your attention. It begins with a number of permissions to be granted, the key one being your location. 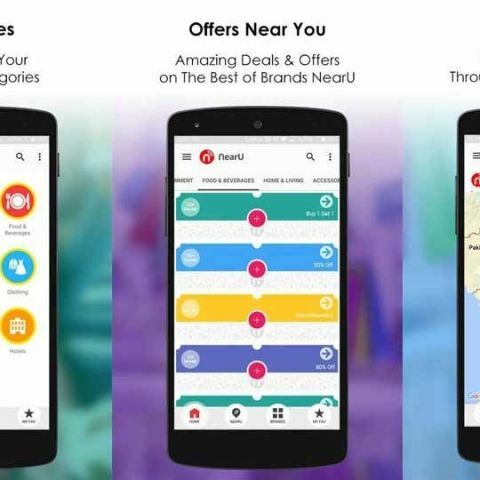 Once you get that done, it will start showing you the offers mentioned above along with the distance of the respective stores in the Home tab. If you want a map view, tap the NearU tab and you will be shown your local map with all the offers highlighted. You can also filter on the map based on categories. The third tab ‘Brands’ lets you filter offers by brands, which is useful if you just want offers from your favorite store and don’t want to browse through a host of listings. The map feature works the other way around as well, as in, you can see the location of a specific offer by tapping the GPS marker on the offer. You can even set certain categories as your favorites from the menu. And once you have selected the offer, you can hit the call button to call up the store to check it out. It also has sharing options where you can share the offer with your friends on third party applications. The design elements of the app could use some improvements, but overall, the app is unique in its offering. Although it would be better if we could still order from within the app for stores that support it, but that might just be us being too lazy!